Colorado Criminal Law - Understanding Criminal Restraining Orders - 18-1-1001 - Denver Criminal Attorney Specializing in Domestic Violence Cases - Colorado Criminal Defense Lawyer. 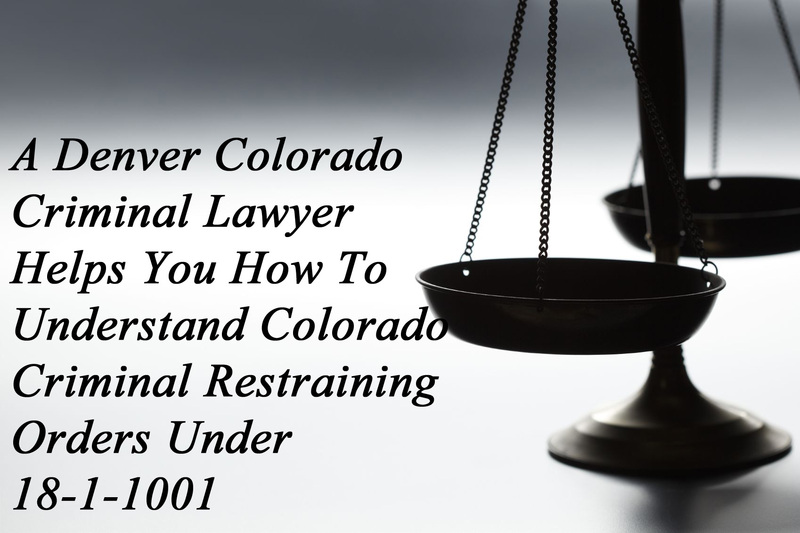 A Denver Colorado Criminal Lawyer Helps You How To Understand Colorado Criminal Restraining Orders Under 18-1-100. Well before a criminal case is ever resolved – dismissed – plea bargained or tried to a jury or a judge – there are serious restrictions on your freedom in the form of bail bond conditions and mandatory criminal restraining orders. This article is intended to help you understand some of those serious restrictions. In Colorado there are several ways a protective order may be issued, this article addresses the most common – the Criminal Case Mandatory Protective Order under Colorado Criminal Law CRS 18-1-1001. The mandatory protective order is issued by the court in ALL criminal proceeding (Colorado Revised Statutes Section 18-1-1001). Different Language For The Same Thing.. Restraining Orders may be called protection orders, no contact orders, and “mandatory” restraining orders These terms can be confusing but they refer to basically the same thing – a court order conditioning your freedom on compliance with a Colorado criminal court order. Criminal restraining orders are issued ONLY in criminal cases by a judge and without the need for a request from the alleged victim. Civil restraining orders are sought by private citizens where they alleged stalking, assaults or domestic abuse for example. Colorado criminal charges need not be filed and civil restraining orders can be filed by a person who feels threatened even if a criminal case cannot be established. (See My Article on Civil Restraining Orders). The Basic Mandatory Criminal Restraining Order: This order retrains a person from harassing, molesting, intimidating, retaliating against, or tampering with any witness or victim it continues until the defendant is no longer under a sentencing order – such as the end of the probationary period. It cannot be lifted. This protective order lasts until the defendant is acquitted or until the defendant is convicted and completes his/her sentence. BUT if a case is dismissed or you are found NOT GUILTY, the protection order is discharged. If there is a conviction, the protection order will be enforced as long as the your sentence continues and this includes the entire term of your probation. If you want to see this version of the Colorado criminal restraining order Click this Link to a Copy of the Form. Can The Colorado District Attorney MODIFY The Restraining Order – Can I Modify It? How Is That Done? The DA can – (as can the Defendant) – seek to modify the restraining order at any time. The so called “protected party,” in a criminal case may request a modification of the protection order must be considered by the trial judge under the Colorado Victim’s Bill of Rights. All judges must be reminded not to “rubber stamp” the District Attorney’s requests and a judge must be forced sometimes to exercise independent judgment as to whether the conditions demanded by the DA are really necessary for the protected person’s safety. (for the defendant) – such mitigating acts as – steps taken by the defendant as counseling that support the reduction in restraining order restrictions. It may come as a shock that even though you have only been accused to a criminal act – so many freedoms can be taken away. While it is true that this happens – your Colorado criminal defense lawyer may use his or her skill to modify oppressive conditions of your bail or your restraining order. Being forced out of your house, restrained from having contact with your wife and – or your children, stopped from going to certain places, prohibited from drinking alcohol or possessing a weapon to defend yourself… are all strong possibilities depending on the criminal charges alleged. What Happens If I Violate A Criminal Case Mandatory Restraining Order Or The Conditions of Bond? Punishment for the Violation of a Colorado Criminal Protection Order is a class two misdemeanor – or in some cases of repeated restraining order violations – a class one misdemeanor – please follow this LINK for more information on this law. ALL protection orders may result in some form of prosecution for non compliance – however criminal restraining order violations can and will result in the commission of a totally new crime therefore it is very important to remove as many of the conditions place on you as a result of bond conditions or the restraining order as soon as possible. If you are convicted of VOP – (violation of an Order of Protection) the sentence must run consecutive to the sentence you receives on the underlying offense – such as a conviction for assault (domestic violence). Even if a case is weak – the addition of ANY new charges increases the likelihood that the DA will not dismiss or favorably plea bargain the underlying charges. Only the judge can relieve you of your obligation to comply with a protection order. Therefor if your wife or girlfriend invites you over – do NOT go you are risking a great deal. If you are confused – you need to contact your Denver criminal lawyer for guidance on exactly how to handle this situation. How Does One Violate A Colorado Mandatory Restraining Order? A no contact order is the easy case – no contact means NO CONTACT – directly between the two of you or through third parties such as family or friends. For other threats to you in terms of a violation of the restraining order – the Colorado courts actually have a form that is called an Incident Checklist – that is used to help the police document a violation of the order. Here is a summary of some of the kinds of “incidents” that could lead to a violation of a Colorado criminal restraining order. (1) There is hereby created a mandatory protection order against any person charged with a violation of any of the provisions of this title, which order shall remain in effect from the time that the person is advised of his or her rights at arraignment or the person’s first appearance before the court and informed of such order until final disposition of the action. Such order shall restrain the person charged from harassing, molesting, intimidating, retaliating against, or tampering with any witness to or victim of the acts charged. The protection order issued pursuant to this section shall be on a standardized form prescribed by the judicial department and a copy shall be provided to the protected parties. (2) At the time of arraignment or the person’s first appearance before the court, the court shall inform the defendant of the protection order effective pursuant to this section and shall inform the defendant that a violation of such order is punishable by contempt. (e) Any other order the court deems appropriate to protect the safety of the alleged victim or witness. (4) Any person failing to comply with a protection order issued pursuant to this section commits the crime of violation of a protection order and may be punished as provided in section 18-6-803.5. (5) Before a defendant is released on bail pursuant to article 4 of title 16, C.R.S., the court shall, in cases involving domestic violence as defined in section 18-6-800.3(1), or in cases of stalking pursuant to section 18-3-602, state the terms of the protection order issued pursuant to this section, including any additional provisions added pursuant to subsection (3) of this section, to the defendant on the record and the court shall further require the defendant to acknowledge the protection order as a condition of any bond for the release of the defendant. The prosecuting attorney shall, in such domestic violence cases or stalking cases, notify the alleged victim, the complainant, and the protected person of the order if such persons are not present at the time the protection order is issued. (6) The defendant or, in cases involving domestic violence as defined in section 18-6-800.3(1), or in cases of stalking pursuant to section 18-3-602, the prosecuting attorney may request a hearing before the court to modify the terms of a protection order issued pursuant to this section. Upon such a request, the court shall set a hearing and the prosecuting attorney shall send notice of the hearing to the defendant and the alleged victim. At the hearing the court shall review the terms of the protection order and any further orders entered and shall consider the modifications, if any, requested by the defendant or the prosecuting attorney. (7) The duties of peace officers enforcing orders issued pursuant to this section shall be in accordance with section 18-6-803.5 and any rules adopted by the Colorado supreme court pursuant to said section. (a) “Court” means the trial court or a designee of the trial court. (a.5) “Protection order” shall include a restraining order entered pursuant to this section prior to July 1, 2003. (b) “Until final disposition of the action” means until the case is dismissed, until the defendant is acquitted, or until the defendant completes his or her sentence. Any defendant sentenced to probation is deemed to have completed his or her sentence upon discharge from probation. A defendant sentenced to incarceration is deemed to have completed his or her sentence upon release from incarceration and discharge from parole supervision. (II) May require that before the defendant is released from custody on bond, the defendant shall relinquish, for the duration of the order, any firearm or ammunition in the defendant’s immediate possession or control or subject to the defendant’s immediate possession or control. (III) Sell or otherwise transfer the firearm or ammunition to a private party who may legally possess the firearm or ammunition; except that a defendant who sells or transfers a firearm pursuant to this subparagraph (III) shall satisfy all of the provisions of section 18-12-112, concerning private firearms transfers, including but not limited to the performance of a criminal background check of the transferee. (c) If a defendant is unable to satisfy the provisions of paragraph (b) of this subsection (9) because he or she is incarcerated or otherwise held in the custody of a law enforcement agency, the court shall require the defendant to satisfy such provisions not more than twenty-four hours after his or her release from incarceration or custody or be held in contempt of court. Notwithstanding any provision of this paragraph (c), the court may, in its discretion, require the defendant to relinquish any firearm or ammunition in the defendant’s immediate possession or control or subject to the defendant’s immediate possession or control before the end of the defendant’s incarceration. In such a case, a defendant’s failure to relinquish a firearm or ammunition as required shall constitute contempt of court. (II) Obtains approval of the transfer from the bureau after the performance of the background check. (III) The agency shall issue a receipt to each defendant at the time the defendant relinquishes possession of a firearm or ammunition. (g)(I) A law enforcement agency that elects to store a firearm or ammunition for a defendant pursuant to this subsection (9) may elect to cease storing the firearm or ammunition. A law enforcement agency that elects to cease storing a firearm or ammunition for a defendant shall notify the defendant of such decision and request that the defendant immediately make arrangements for the transfer of the possession of the firearm or ammunition to the defendant or, if the defendant is prohibited from possessing a firearm, to another person who is legally permitted to possess a firearm. (II) If a law enforcement agency elects to cease storing a firearm or ammunition for a person and notifies the defendant as described in subparagraph (I) of this paragraph (g), the law enforcement agency may dispose of the firearm or ammunition if the defendant fails to make arrangements for the transfer of the firearm or ammunition and complete said transfer within ninety days of receiving such notification. (II) From the licensed gun dealer who requests from the bureau a background check of the transferee, as described in section 18-12-112, a written statement of the results of the background check. (B) The court shall issue a warrant for the defendant’s arrest. (II) In any subsequent prosecution for a violation of a protection order described in this paragraph (i), the court shall take judicial notice of the defendant’s failure to file a receipt or written statement, which will constitute prima facie evidence of a violation of the protection order pursuant to section 18-6-803.5(1)(c), C.R.S., and testimony of the clerk of the court or his or her deputy is not required. (j) Nothing in this subsection (9) shall be construed to limit a defendant’s right to petition the court for dismissal of a protection order. (k) A person subject to a mandatory protection order issued pursuant to this subsection (9) who possesses or attempts to purchase or receive a firearm or ammunition while the protection order is in effect violates the order pursuant to section 18-6-803.5(1)(c). (l)(I) A law enforcement agency that elects in good faith to not store a firearm or ammunition for a defendant pursuant to sub-subparagraph (B) of subparagraph (III) of paragraph (b) of this subsection (9) shall not be held criminally or civilly liable for such election not to act. (II) A law enforcement agency that returns possession of a firearm or ammunition to a defendant in good faith as permitted by paragraph (f) of this subsection (9) shall not be held criminally or civilly liable for such action. ABOUT THE AUTHOR: H. Michael Steinberg – Email The Author – A Denver Colorado Criminal Restraining Order Criminal Defense Lawyer – or call his office at 303-627-7777 during business hours – or call his cell if you cannot wait and need his immediate assistance – 720-220-2277. 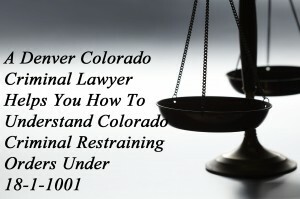 If you are charged with A Colorado crime or you have questions about the topic of this article A Denver Colorado Criminal Lawyer Helps You To Understand Colorado Criminal Restraining Orders Under 18-1-1001, please call our office. The Law Offices of H. Michael Steinberg, in Denver, Colorado, provide criminal defense clients with effective, efficient, intelligent and strong legal advocacy. We can educate you and help you navigate the stressful and complex legal process related to your criminal defense issue. Colorado Defense Lawyer H. Michael Steinberg provides solid criminal defense for clients throughout the Front Range of Colorado – including the City and County courts of Adams County, Arapahoe County, City and County of Boulder, City and County of Broomfield, City and County of Denver, Douglas County, El Paso County – Colorado Springs, Gilpin County, Jefferson County, Larimer County, and Weld County,…. and all the other cities and counties of Colorado along the I-25 Corridor… on cases involving the topic of this article …A Denver Colorado Criminal Lawyer Helps You To Understand Colorado Criminal Restraining Orders Under 18-1-1001.